Live at Gondel Kino, Bremen, Germany, June 25, 1971. 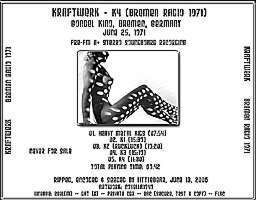 "There isn't any extra information about this unofficial release either in the liner notes or on the interweb thing - however, as you listen it becomes obvious that this is indeed a recording of the rather short-lived lineup of Kraftwerk that includes Michael Rother and Klaus Dinger in its ranks! That's right - Neu! as part of Kraftwerk!!! 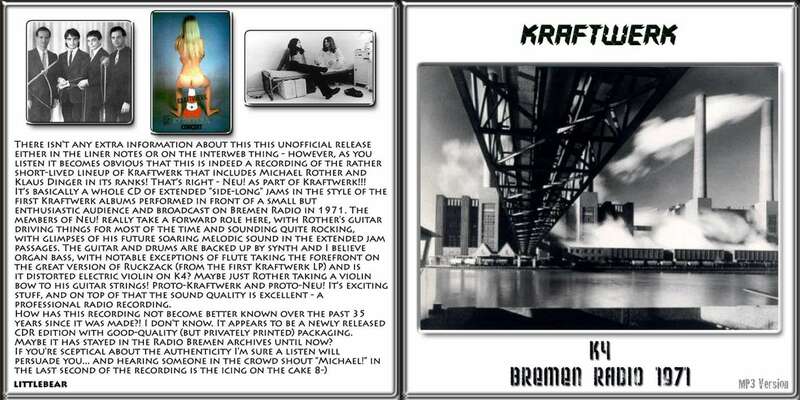 "It's basically a whole CD of extended "side-long" jams in the style of the first Kraftwerk albums performed in front of a small but enthusiastic audience and broadcast on Bremen Radio in 1971. The members of Neu! really take a forward role here, with Rother's guitar driving things for most of the time and sounding quite rocking, with glimpses of his future soaring melodic sound in the extended jam passages. The guitar and drums are backed up by synth and I believe organ bass, with notable exceptions of flute taking the forefront on the great version of Ruckzack (from the first Kraftwerk LP) and is it distorted electric violin on K4? Maybe just Rother taking a violin bow to his guitar strings! Proto-Kraftwerk and proto-Neu! It's exciting stuff, and on top of that the sound quality is excellent - a professional radio recording. This isnt the motorik, some might even say monotonous, electronic sound of Kraftwerk. 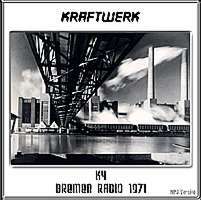 Early Kraftwerk were more experimental with sounds and effects - not quite dance music. Click on the highlighted tracks to download the MP3s (these are high quality, stereo MP3s - sample rate of 192 kibit/s). As far as we can ascertain none of the tracks have been officially released. A+ Stereo Soundboard Recording taken from a recently issued R.O.I.O. Click on the link to buy Kraftwerk albums.